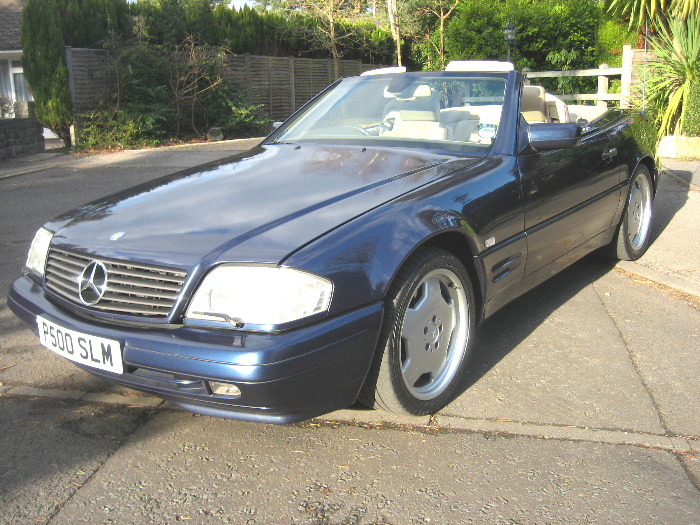 MERCEDES-BENZ SL500 Convertible, Automatic, Convertible, P Reg, 75,000 miles, Azurite Blue Metallic. Front Fog Lights, Power-Assisted Steering, ABS, Adjustable steering column/wheel, Anti theft system, Climate Control, Colour coding - Body, Cruise control, Driver airbag, Electric mirrors, Electric windows, Electrically adjustable seats, Front armrest, Full service history, Head restraints, Headlight washers, Heated seats, Leather seats, Leather upholstery, Remote locking, Radio/CD Multichanger, Tinted glass, Traction control, Wood/wood effect trim. Powerhood,Hard and Soft Tops,Wind deflector,Memory Selection,18 AMG Alloys,Plate included in price,Stunning car in Superb condition.